The weather has finally turned bad – no rain but stupidly windy on the A9 autoroute going north. On arrival at Tarascon and checking the weather forecast, it looked like the winds were up to 90kph on the way up. The sat-nav also went nuts, trying to take us in to Nimes, then ignoring the correct juntion for Tarascan. No matter, we got here. This is the maddest place ever. There is a car park next to the campsite, which we arrived at an hour before reception was due to open, so parked up in the car park, under the sign saying no motorhomes. The police arrived, drove around me looking at the sign, then drove off again. Then some strange man, believed to be the campsite owner, let us into the site. We parked up on a pitch, soon to be greeted by a small kitten which was very friendly, but scared of sudden movements. Then the chickens arrived. They clucked around for a while, then left. The strange man/campsite owner returned clutching a toy fire engine and a plastic tricycle, along with a couple of dogs, which he introduced to us. The were very nice, not biting us. Eventually reception opened so we booked in. 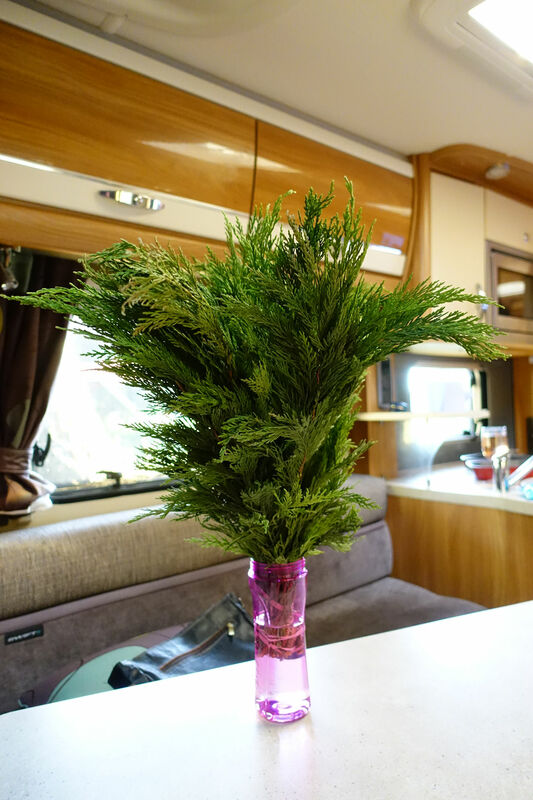 The strange man/campsite owner returned and gave us some bits of tree. We have no idea why he did this, or what we are supposed to do with the tree, but but we accepted it gracefully and put in a glass. This entry was posted in France - Autumn 2018 on October 1, 2018 by Kenny Mitchell.